On 18th July 1913, around 20,000 people turned out at Ballymena Showgrounds to welcome the Ulster Unionist leader Edward Carson on a three day visit to the area. As well as the general public around 600 Ulster Volunteers marched to the show grounds to be reviewed by Carson. Carson made a rousing speech asking Unionists to stick to their cause and warning of the 'dangers'of Home Rule. The public meeting ended with three cheers and the singing of the national anthem. Carson stayed on in Ballymena, with the Young family at Galgorm Castle, for two more days. They toured Ballymena on the Saturday meeting various local Unionists and on the Sunday attended First Ballymena Presbyterian Church for morning worship. He left on the Monday morning to continue his tour of Ulster. 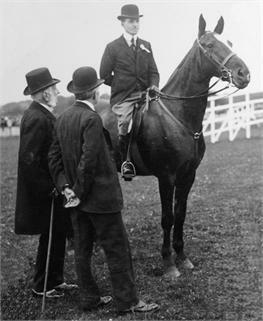 Edward Carson and William Young with Captain Arthur O'Neill on the horse.